Her sire, Black Kettle, is a son of Sittin Bull and her dam is a daughter of 72" TTT, LP Sombrah. Add to that the genetics of The Shadow, Gun Smoke, Hunts Command Respect, Roundup, Hashbrown, Watson's Independence, Delta Judy and Jet Jockey to name a few. 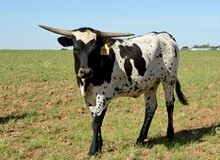 She has it all....top producing genetics, conformation and size, spectacular color, good disposition and horn. Kettle Mae is a Millennium Futurity 2014 class winner. All of her offspring will be Millennium Futurity eligible. Exposed to 79.6250" TTT and 100"+TH, TS Lone Star 22/5, on 06/29/2018 to 09/29/2018 for a spring 2019 calf. Lone Star's sire is TS Magnificent Ken, a son of Concealed Weapon and out of 78.75" TTT, SDR Rio's Dotty, a daughter of JP Rio Grande and Delta Dotty.